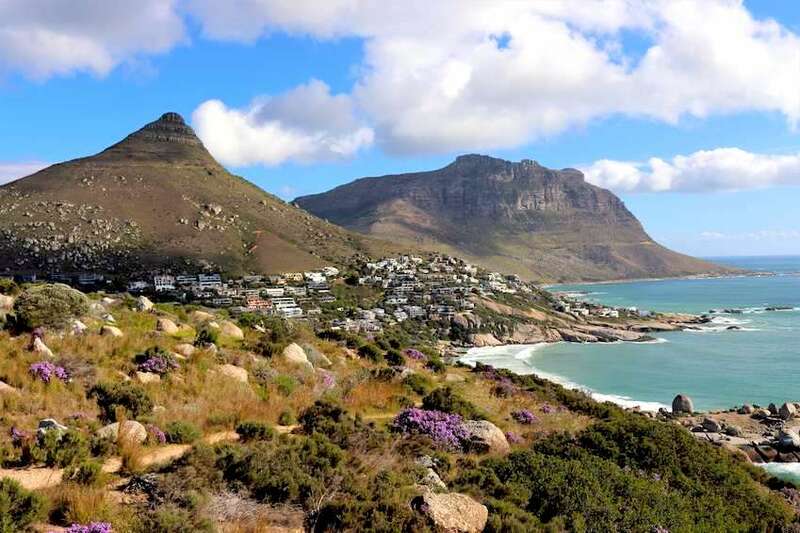 The capital of South Africa, Cape Town is a city that is dominated by the delights of the open air, with Table Mountain towering above it and the Atlantic and Indian Oceans spreading out below it. It is a city that enjoys a warm and dry climate from October to April, when the weather is perfect for enjoying the beaches, mountain hikes, adventurous water sports and wildlife interactions of the area. December to February are the hottest months and the most popular time for beach holidays in the area, however from February until April holiday goers enjoy less wind and less crowds. This is a haven for those who thrive on adventure and thrills, with jaw-dropping high viewpoints and the chance to dive with one of the greatest ocean predators, the great white shark. One doesn’t have to go to the extreme of getting in the water with a great white however. 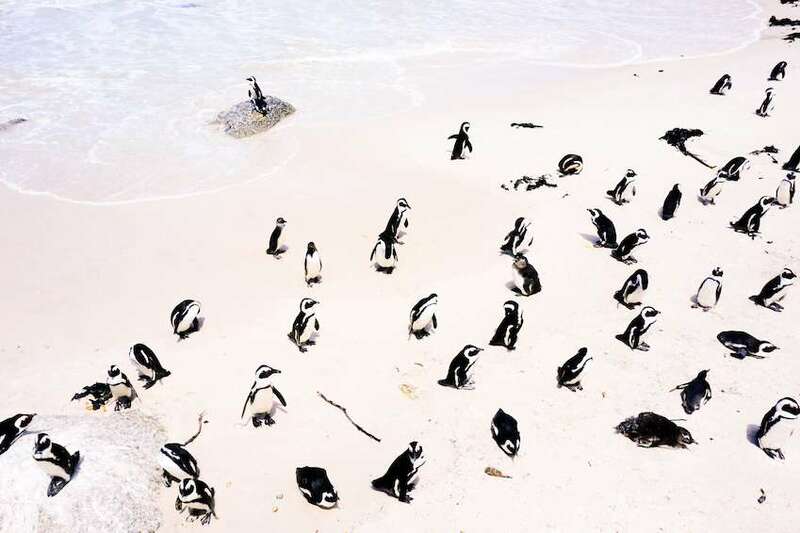 Alternatively, you can swim with the very unintimidating African penguins at Boulders Beach. Large granite boulders shelter it from the wind and waves and allow the water to be warmer here, making the area perfect for children and less confident swimmers. Wooden boardwalks then weave through the dunes to Foxy Beach, which provide brilliant views of the penguins below. The wildlife interaction opportunities don’t end there; the waters around Cape Town are also home to many species of whales at the right time of year. If you’re desperate to see these beautiful giants, July to September is the season where migratory southern right whales return to the coastline. You can actually watch the cetaceans from many points on the land, such as up high on Boyes Drive above Kalk Bay or along the road on the False Bay coast. Hermanus, an hour and a half’s drive from Cape Town, is said to have some of the best land-based whale watching in the world as the whales are sometimes mere metres from the shoreline, and it is also a popular spot for calving. Expressive humpback whales can also be spotted from May until December. If you want a closer interaction, you can organise a kayaking trip where you can be on the same level as the beautiful creatures, a guest in their ocean home. Undoubtedly one of the most popular ocean activities around Cape Town, however, is the opportunity to snorkel with playful Cape Fur seals that are found nowhere else in the world! These seals are highly inquisitive, and will often come right up to you to check you out, before swimming off to continue their underwater acrobatics. There are many tour companies that take small groups with professional dive guides, that allow you to have a safe and intimate experience. For other scenic and safe coastal swimming spots, head to one of Cape Town’s 19 man made tidal pools such as the one at St James, where the water is shallow, sheltered and perfect for doing lengths or for family bathing. 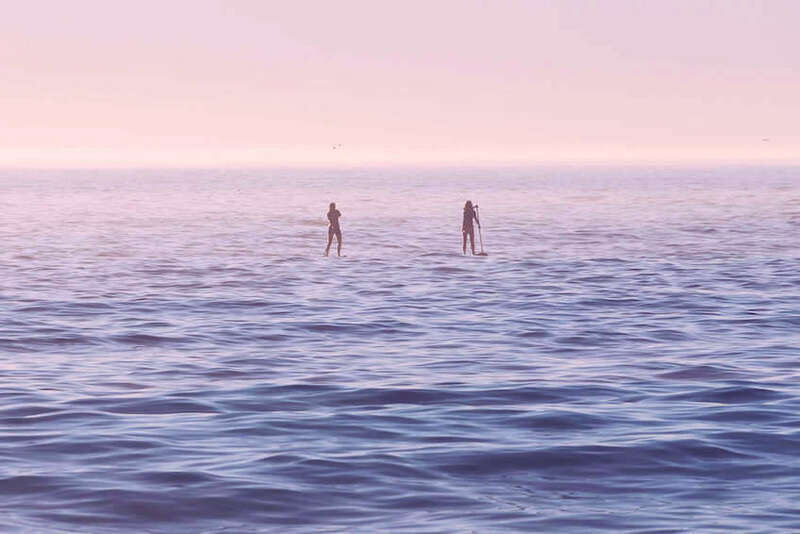 Still in the realm of the aquatic, stand-up paddle board (SUP) yoga is the fantastic (and potentially very funny, if your balance isn’t the best) marriage of two physical activities in the stunning setting of Cape Town’s coasts. Tune-in with your body, pay attention to your breathing, and find utter bliss in the calm waters, enjoying a refreshing dip every time you fall off your board! If you want something that’s a little amped up in energy that will get your adrenaline pumping, try coasteering, which involves scrambling along the coast’s cliffs and rocks, jumping and swimming and snorkeling in the crystal clear water. Moving away from the coast, the Kirstenbosch National Botanical Garden is very worth a visit for its scenic wooden treetop walkway, the Boomslang (tree snake), which weaves through the canopy for 130 metres. Sometimes it touches the forest floor, and at other points it reaches a height of 12 metres above the ground, offering a wide variety of incredible green vantage points. Contrastingly, head underground to one of the region’s many caves that inspire stories of smugglers and beasts as well as being places of quiet and solitude. Woodstock Cave is particularly impressive, as it forms a long, horizontal crack in the Devil’s Peak mountainside to provide a stark contrast between dark cave interior and the bright spread of Cape Town far below. Stadsaal Cave in Cederberg is another favourite, as it is in a unique area that has spectacular rock formations, and the cave itself is made up of many caverns, with many displays of beautiful and historically-important rock art. For a little tranquility and down time during your stay in South Africa, why not indulge in a day on a luxury houseboat in the West Coast National Park or surrounding areas. One such example is the fairytale wooden cottage floating in Knysna Lagoon, with outdoor decks and a dinghy that can take you to the waterfront in 2 minutes. 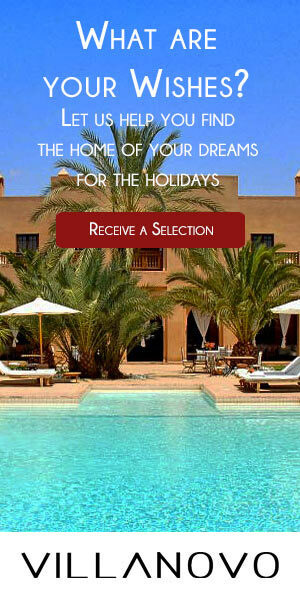 If you’re lucky this is also a wonderful whale watching location! Kraalbai Houseboats have several options of houseboat in the West Coast National Park, which has many secret beaches that you will be in an ideal location to explore. The majority of houseboats are also equipped with kayaks and stand-up paddle boards, which you can use at your own pace and just float on if you wish, enjoying the calm of life on the water. Another outdoor activity that requires little energy is a trip to an open air cinema. The Galileo cinema provides a real show for the eyes, as behind the screen and all around you is the breathtaking mountainous scenery under glistening starlight. Showing a wide variety of genres from cult classics to documentaries, the experience is completed with delicious food stalls, music and interactive games that will entertain all. If you’re an avid photographer, the abandoned Macassar beach pavilion, on the False Bay coast, is a beautifully haunting sight with its lonely waterslides filled with sand instead of running water. In fact, the sand has completely infiltrated every crevice of the once-thriving tourist attraction, providing some very dramatic scenes of indoor dunes amongst the worn paint and graffiti. Another unusual activity, that is often located on a beach, is Secret Sunrise. This is an incredibly positive movement that celebrates the beginning of the day through dancing with both friends and strangers. The location is always disclosed last minute, then you arrive, take a pair of wireless headphones, and salute the sunrise in whatever way you want. It is a wonderful activity that brings about a feeling of community spirit and togetherness in a glorious natural setting. 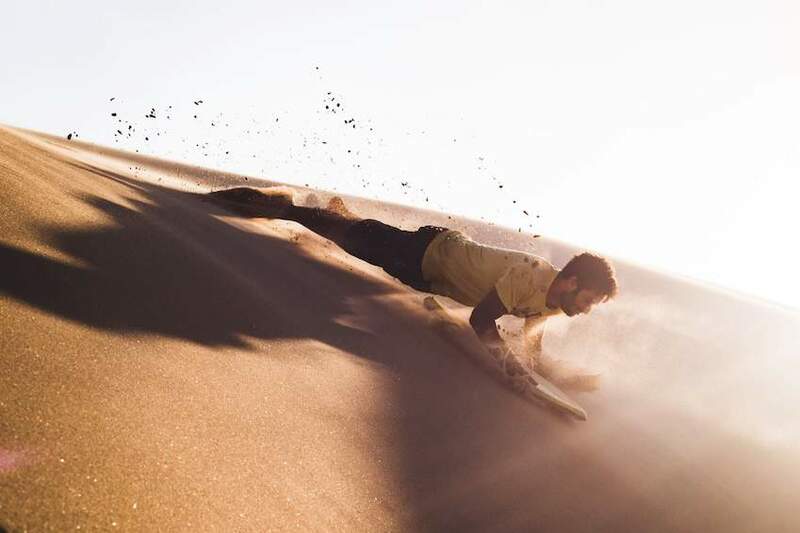 Another way to enjoy the fine sands of Cape Town in the spring and summer is to try sandboarding! Exactly the same as snowboarding, except you’re in shorts and a t-shirt instead of a jumpsuit, and it’s not snow that’s spraying behind you. Even the truck ride to and through the dunes is a thrill, with many exciting bounds and climbs up the steep slopes. 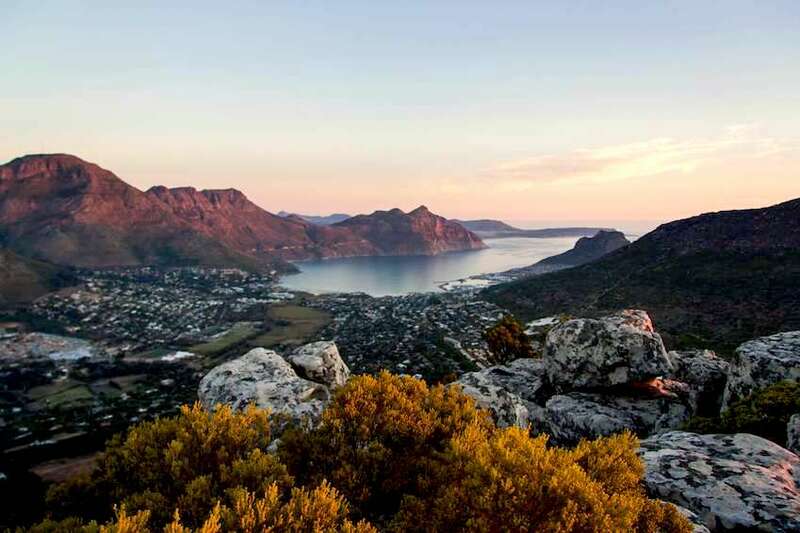 It’s a true example of Cape Town’s unfailing ability to bring together stunning natural landscapes and exhilarating experiences.